The movie strips most of the better plot points of the original manga. They cut out the main villain and backstories get simplified. So all you get is a waste of time, constant references to sleeping beauty and no real pay off. Seriously go look up the manga instead. There's a fight between a naked bird woman and a flaming octopus man. $#!% gets crazy! I think this anime is amazing but quite a few people seem to hate it, and i wonder if it's because they missed alot of small essential details. You really need to put full attention to use here. 1. A comet containing an alien virus, the Medousa virus, crashes to earth, landing in a small Siberian village. 2. A little girl, Alice, has been mistreated here and because of that trauma the Medousa virus in her allows her to bring her imaginary friend to life. 3. Her creation soon destroys the village, calling the attention of scientists (working for the top medicine production company) and soldiers. It's shot on sight. 4. Alice is sad but goes with Peter and his people willingly to be experimented on. 5. Peter considers this virus to be a message from God and seeks to evolve mankind. He starts talking differently in public, raising some flags. 6. Alice, otherwise immortal, dies from the experiments. Peter is regretful of his single minded pursuit. 7. The drug company releases the virus to search for new research subjects. Soon many people are infected and dying by turning to stone as the special affect only occurs rarely. 8. Marco is a CIA agent. His sister, Laura, dies when, in fear of Medousa, she jumps from a building but turns to stone before even hitting the ground. 9. The drug company announces that it has created a facility to cryogenically freeze a random selection of 106 infected people until a cure is hopefully found. It's really part of their secret research facility though. 10. America, suspicious of this, decides to send in a spy. Marco either volunteers or is chosen. Peter, due to his guilt, becomes Marco's inside contact. 11. Kasumi and Shizuku are twins who applied for the program. Shizuku has a scar on her leg from a past incident that Kasumi feels guilty about. Kasumi is shy and wears glasses, Shizuku doesn't have glasses and is the more confident one. 12. Kasumi and Shizuku learn that only Kasumi was chosen for the program. In despair, Kasumi attempts suicide hoping to leave her spot in the program to her sister but Shizuku stops her. Kasumi now has a scar on her wrist. 13. The 106 people, and their companions, are bussed to the facility. 14. 1 infectee runs out of time before the meeting is even over. Marco is disguised as a criminal. Chips are implanted. 15. Kasumi, after realizing that if it will really take a hundred years to wake up that she will never see Shizuku again, snaps and asks Shizuku to jump off the nearby cliff with her. Shizuku refuses and they struggle. Kasumi falls to her death and when Shizuku realizes this, she awakens as a special Medousa infectee. 16. The scientists detain Shizuku, hoping to use her as a new test subject, while the others continue on and are frozen. 17. The scientists are unable to contain Shizuku and she takes over the facility, twisting it into a tower of thorns and monsters. She places her sister's dead body on a slab in the highest tower. 18. Shizuku creates a new Kasumi, testing her and remaking her until she is someone who can live a happy life. She doesn't recreate Kasumi's scar as she doesn't want that to be a part of her. 19. Due to the repeats, the memories of the main participants are a little confused. And since she can manipulate what they see via the chips, it's hard to say what's real. 20. Peter steals a dead patient's outfit to blend in with the other survivors. They wake up to find the room overrun with bat-like monsters and vines. The majority of participants die when rushing into an elevator occupied by a monster. 21. The small group struggles to escape. Amid this Katherine somewhat subtly reveals that she was probably an abusive mother who lost custody of her child, she resolves to protect young Timmy who's obsessed with games and wishes for his parents to get back together. Alexandro, a wealthy politician, reveals that he paid to get in, bribing the family of someone who had been chosen, and is first to die. Kasumi2 remembers pieces of the past and some remade memories, following Shizuku's wish, she tries to keep going. Peter eventually reveals some of the truth and tries to pass the information off on a chip but dies and it is destroyed. Marco saves Kasumi2 more than once and she stands up for him when the others realize he lied. Ron is a policeman and decides he wants to keep the group safe, his bracelet, which tracks the virus, shows he has little time and he dies to help the group escape. They discover it's only been two days since they arrived. 22. Kasumi2 remembers where Shizuku is supposed to be and heads there. (At this point my order may be a little off it's been a couple days since i watched but it's right in the show so you can easily go see how it goes). Marco finds a helicopter and plans to go after Kasumi2. Katherine dies in the helicopter, after trying to leave Kasumi2 behind in order to save Timmy and herself. 23. The helicopter crashes but Marco and Timmy survive. Marco has an encounter with Shizuku and realizes she's using the chip to appear as his sister, he shoots the chip out in order to escape the illusion. 24. Kasumi2 reaches the tower room. 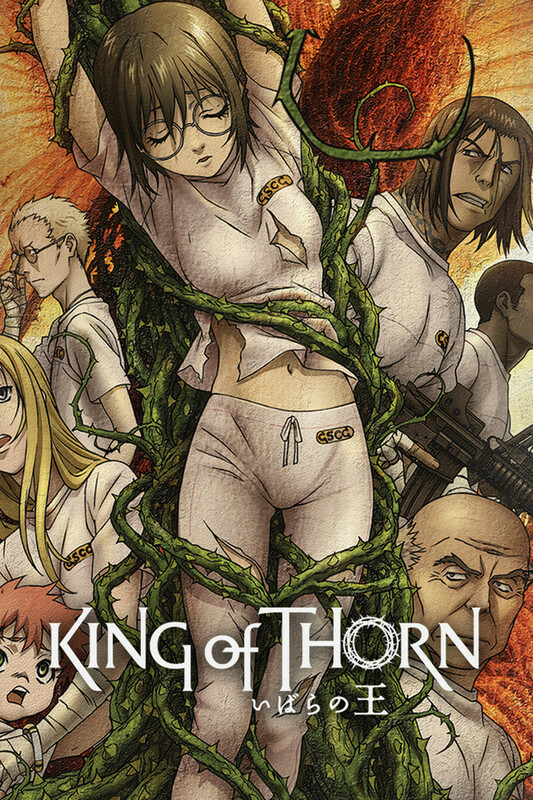 Shizuku, appearing as part of the thorns, tries to stop her but Marco causes a disturbance and Kasumi2 learns the truth. 25. Shizuku tells Kasumi2 once again that she must live. Marco escapes with Kasumi2 but Shizuku stays and dies in the building collapse. 26. The thorns fall, leaving a path for the survivors to follow. Marco dies from his injuries. Kasumi2, being an imagined being is no longer suicidal, depressed, sick, or full of anxiety. Peter calls her sister (whether because he sees her as a sister or because it's a polite way of addressing someone of that age isn't clear). Kasumi2 throws away the Medousa monitoring bracelets her and Timmy have and tells him they're gonna go look for his parents. They follow the thorn path away from the castle. 25. Since it has only been two days it's likely the world is about the same as when they left, however no cure has been found so it's possible that soon the population will be cut down to a few people with extraordinary powers of creation. I left a few little details you can discover yourself if you want. personally i tried the manga and got bored but that's me. This was easily one of my favorite manga series and I waited so long for it to get either a film adaptation or a series. Read the manga- skip the movie. While it is visually stunning all the amazing, tragic, beautiful, and dark scenes from the manga are straight gutted out. Was totally disappointed. The plot doesn't make cohesive sense because it's missing most of it's substance. A bit simple, but really well executed and entertaining movie. This is a movie that has quite a couple of twist and mystery up until the end. Basically, what's truth end up being modified multiple time until, at the end, the real truth is revealed. The Audio is really great. Good soundtrack. Nothing bad to write about it! I removed another 0.5 star (making it 4/5 total) due to an issue with the movie's general plot and identity. Basically, the movies lack its own identity and seems to switch genre and style too many times. Starts as a semi-sci-fi political mess which involving hundred of peoples selected out of billions than turn into some kind of survival where only an handful survive while the rest dies horribly within 5 minutes which then turn into some kind of randomly-walking-simulator in a Resident-Evil-like fashion until basically you learn the truth and nothing has changed since the beginning of the movie. There's an introduction, turn into a mess, have some development, but lack a clear ending/resolution. Don't get me wrong! It IS entertaining and fun to watch, but the overall scenario reeks of inconsistencies and mostly what we could consider "fillers until death does them apart". That's clearly NOT a movie I would have been glad to see at a movie theater. It's kinda, in terms of quality, a Direct-2-Disk quality. I do recommend it to anyone loving the kind of semi-survival mess with a couple of plot twists in it. I don't regret watching it and don't feel I have lost my time, but I wouldn't want to watch it more than once. This is why I give it a 4 out of 5. It's good, not perfect at the first watch.